Pearl C. Hsiung, Simurgh (2017). Acrylic and spray paint on canvas, 60 x 78 inches. Image courtesy of the artist and Visitor Welcome Center. Photo: Ruben Diaz. Offset from the bustle of the city and the winding hallways that lead to Visitor Welcome Center, Pearl C. Hsiung’s recent paintings offer a meditative respite, and ultimately a call for active self-reflection. 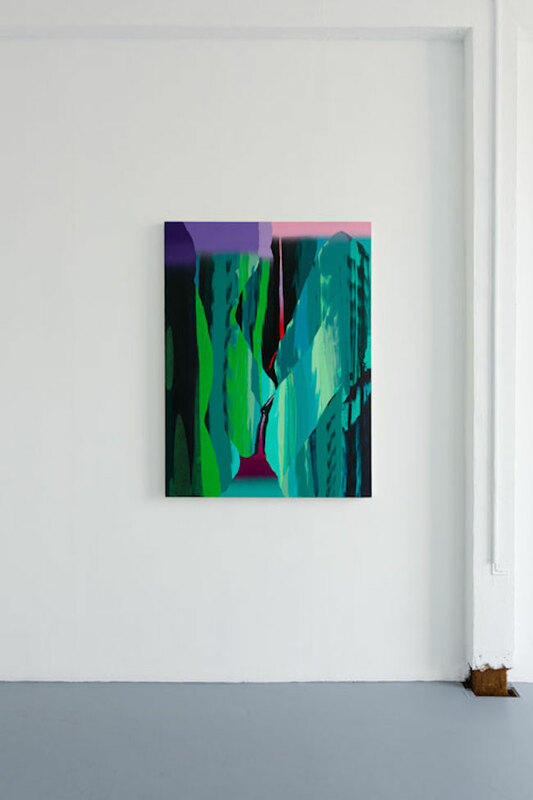 The artist has honed a technique of mixing somber and electric hues, which she carefully drags and flattens into each other in tiered configurations. Though inherently abstract, these areas are cut through by bright, downward-plunging shafts that suggest waterfalls pouring through mountainous landscapes, albeit in dreamlike Technicolor. The overtly figurative, psychedelic vistas that populated so many of Hsiung’s previous series are here largely toned down, instead emphasizing tonal shifts and textural play. Yet, a correlation between these liquescent crevices and the human body is never far afield, lending allegorical weight to the artist’s decorative surfaces. Their chutes and abysses suggest portals to transcendent psychic states and otherworldly territories; bound to the wall, however, these allusions and energies can only get us so far. 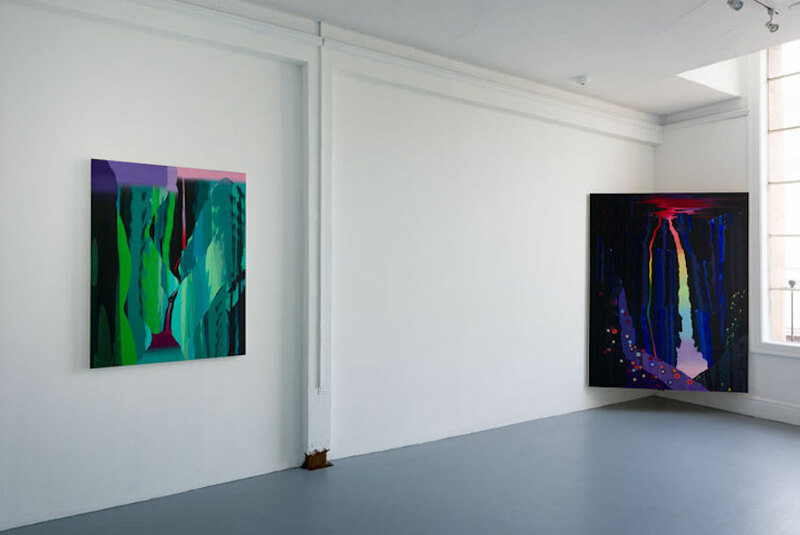 Hsiung’s paintings are in fact most successful when they enter the domain of installation, where viewers can interact physically with her work’s prismatic effects. 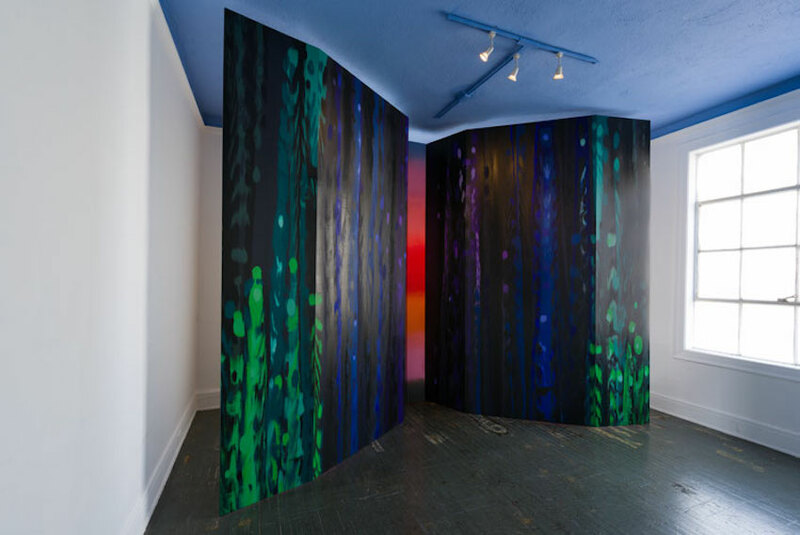 In Full Gorge (2017)—which occupies its own room and is the exhibition’s namesake—two visibly false walls are covered in dark, leafy patterns and flank a column of pulsating orange-red, its sunset-like glow looking impossibly radiant. Hsiung reworks Rothko’s sublime, removing its pretense and advertising its artifice, while still asserting both nature and abstraction’s power to influence human consciousness. 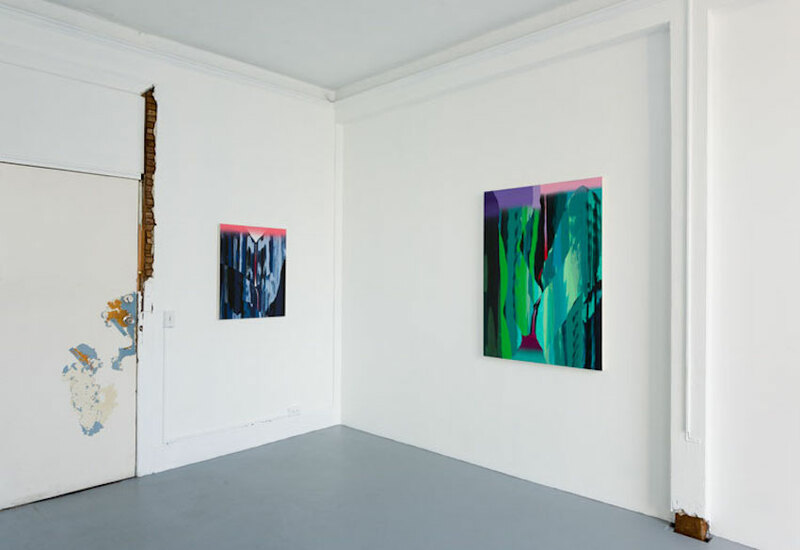 By immersing her audience, the artist offers a welcome middle ground between painting’s staid tendencies and the disconnected, if enthralling, hyper-reality that continues to insert itself further into daily life. Pearl C. Hsiung: Full Gorge runs May 13–June 24, 2017 at Visitor Welcome Center (3006 West 7th Street, Suite 200A, Los Angeles, CA 90005). 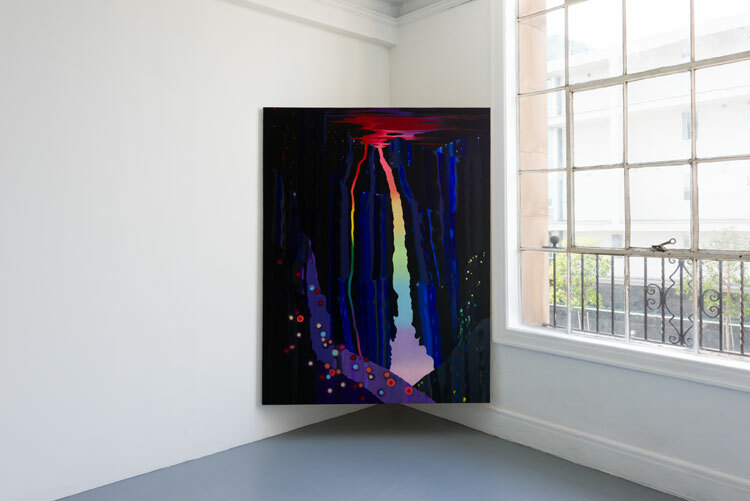 Pearl C. Hsiung, Full Gorge (2017) (installation view). Image courtesy of the artist and Visitor Welcome Center. Photo: Ruben Diaz. Pearl C. Hsiung, Baubo (2017). Acrylic and spray paint on canvas, 36 x 48 inches. Image courtesy of the artist and Visitor Welcome Center. Photo: Ruben Diaz. 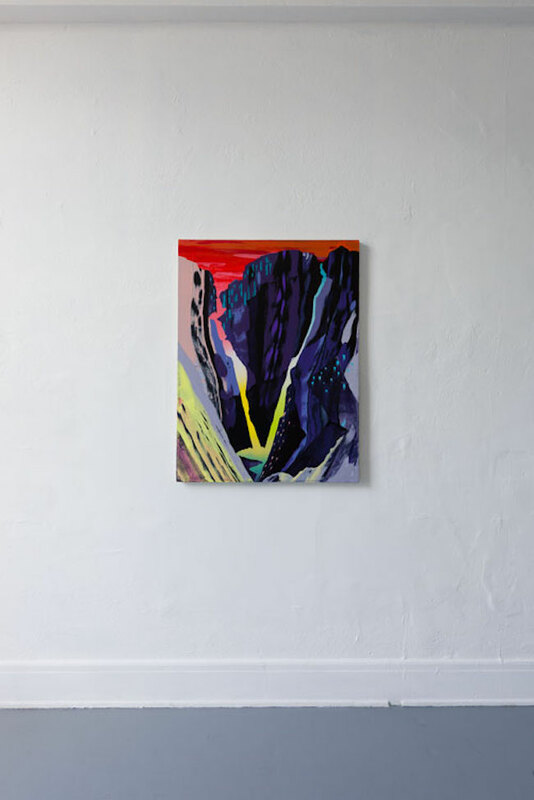 Pearl C. Hsiung, Full Gorge (2017). Acrylic, spray paint, MDF, and wood, dimensions variable. Image courtesy of the artist and Visitor Welcome Center. Photo: Ruben Diaz. Pearl C. Hsiung, Sige (2017). Acrylic and spray paint on canvas, 30 x 40 inches. Image courtesy of the artist and Visitor Welcome Center. Photo: Ruben Diaz.